NEW YORK, Oct. 3, 2014 – GROHE Blue® Chilled & Sparkling was named as one of the 100 Best New Products by Professional Builder magazine in the Interior Products category. In the past 12 months, building product manufacturers introduced a vast number of new products. The magazines’ readers, through responses and inquiries, selected these standouts as the 100 Best New Products. GROHE Blue Chilled & Sparkling combines a modern faucet with a high-performance filter, cooler and carbonator – and is as easy to use as an ordinary kitchen faucet. 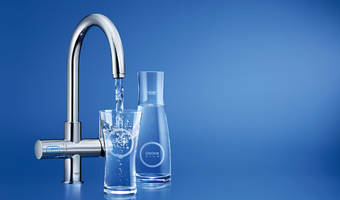 The right lever on the faucet is used to mix hot and cold tap water as usual, while a single turn of the left handle provides filtered and chilled, medium sparkling or full sparkling water. It is also equipped with two separate internal waterways to ensure that once the water has been filtered, it never comes into contact with anything that may alter taste. According to a recent blind taste test , 73 percent of participants concluded GROHE Blue Chilled & Sparkling offered superior freshness over leading still mineral water. The product eliminates the need for plastic bottles and pays for itself in less than 250 days, saving you nearly $400 in the first year of use. Using a GROHE Blue filter system means taking responsibility for the environment.